Every year I look forward to the late summer crop of wild blackberries beside the trails near my home. The thorns and prickles on the blackberry bushes make picking the fruit a challenge, but the berries taste wonderful. They are great to eat fresh from the bush or later as a dessert. Picking wild blackberries is a popular late summer and early fall activity here in southwestern British Columbia. People are not so happy when the blackberry plant invades their gardens, which it does if it gets the chance. The Himalayan blackberry is the species that grows near my home. 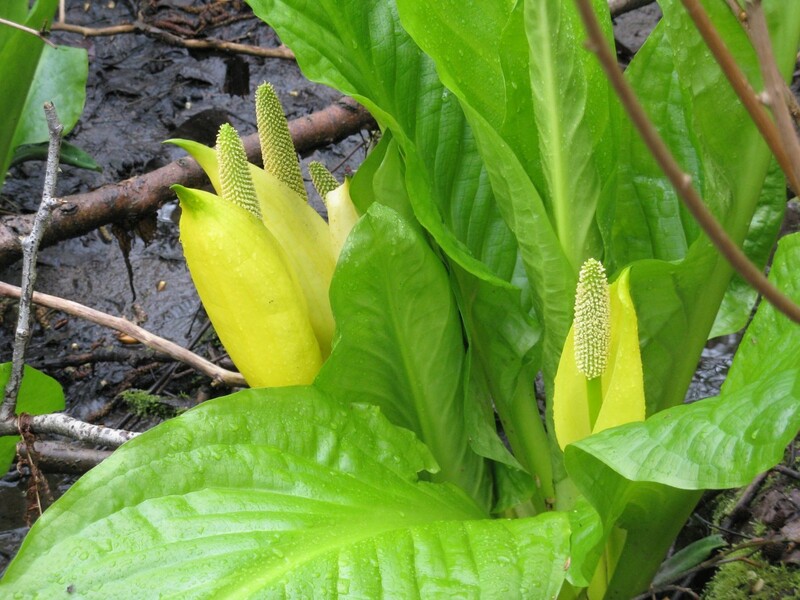 It isn’t native to British Columbia and is very invasive. Once the plant has established itself in an area, it’s hard to get rid of. I enjoy photographing the blackberry in spring and summer, though. At this time of year it's an attractive plant. All of the photos in this article were taken by me. 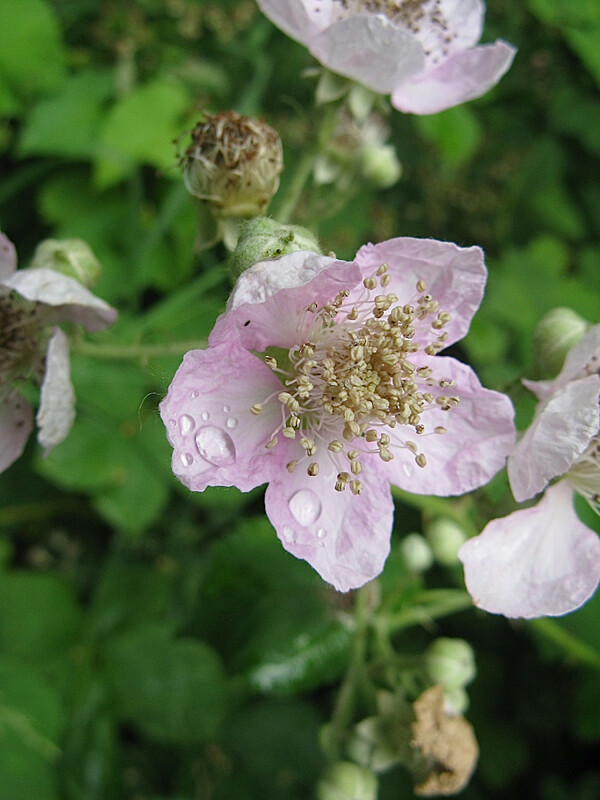 The usual scientific name of the Himalayan blackberry is Rubus armeniacus, but it's sometimes known as Rubus discolor. 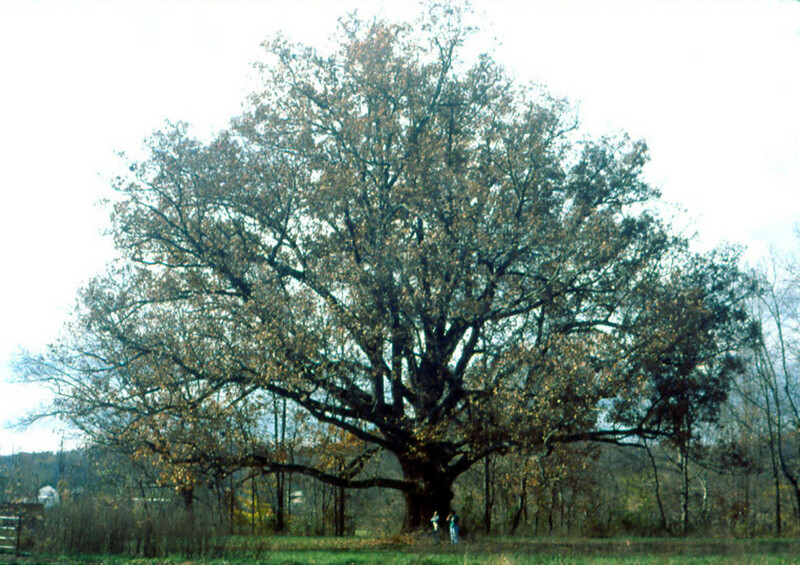 It grows in many habitats, including the edge of forests, in open woodlands, beside trails and roads, in gardens, beside rivers, and on farmland. It can reach a height of three meters, or almost ten feet. The mature stems of the Himalayan blackberry plant are thick and are known as canes. The canes are green or red and bear large thorns that have a red base and a sharp, light green point. A cane can grow as long as twelve meters (about thirty nine feet). The stem of the young plant grows upwards at first, but soon it bends over in a graceful arch to reach the ground. It then grows along the ground and may send roots into the soil. The prickly and sprawling blackberry bush is sometimes known as a bramble. 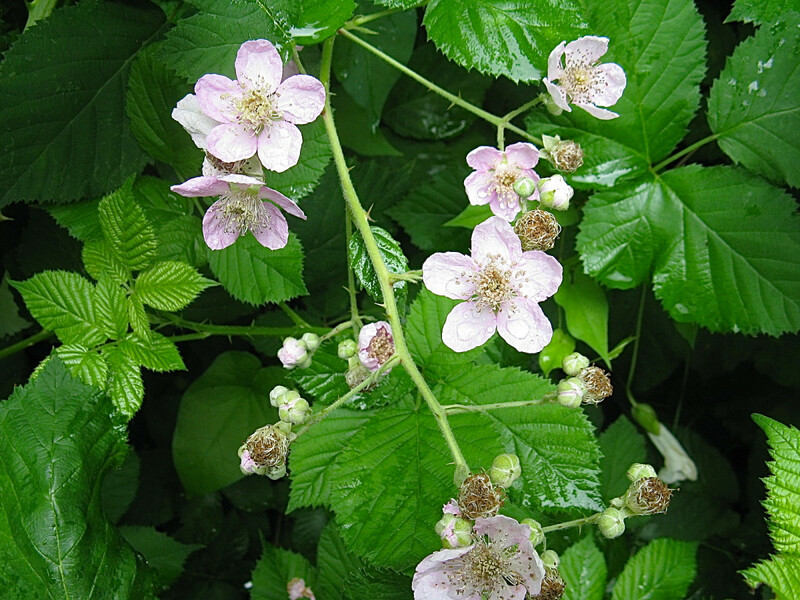 The word "bramble" may also be used for the fruit of the plant. 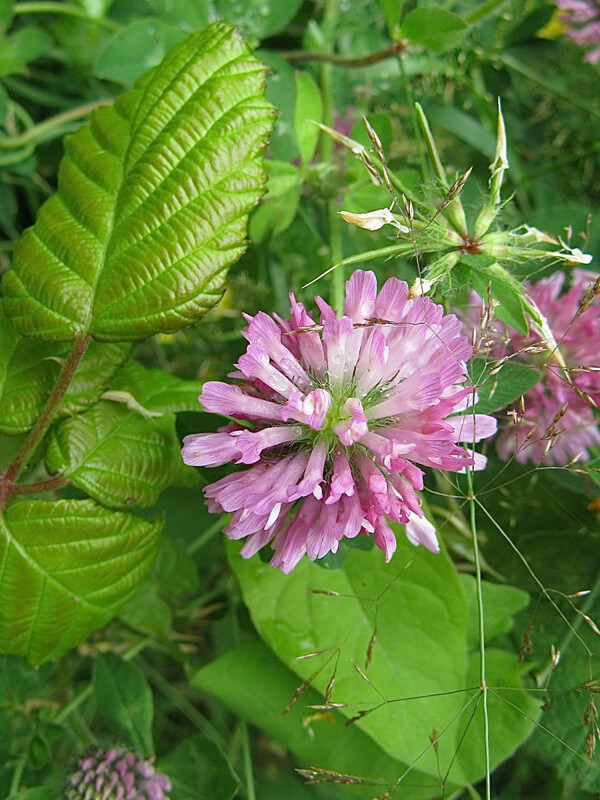 Each leaf has five leaflets (or sometimes three). These are green on the upper surface and grey-green on the undersurface. The leaflets have a roughly oval shape, a toothed edge, and a pointed tip. The top leaflet is the biggest one. All of the leaflets are attached to a common point, forming what is known as a palmate pattern. The plant is an evergreen. The petioles (leaf stems) branch from the cane in an alternate arrangement and have fine prickles, which like the cane thorns often point backwards. The prickles on the petiole continue along the underside of the midrib of each leaflet. The plant is armed very well against any creature—including humans—that wants to attack it. Canes in their second year of life produce flowers. 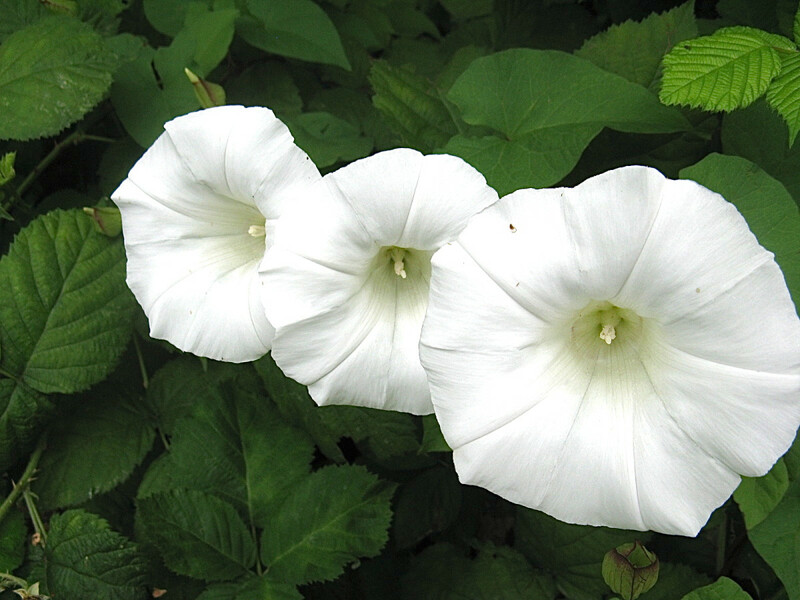 The flowers have five white or pale pink petals and have both male and female reproductive structures. They are borne in clusters. Their stems have prickles, ensuring that picking the berry will be a very difficult task unless thick, protective gloves are worn. The "berries" are black or dark purple. Botanists don't classify the fruit as a berry, though. A blackberry or raspberry fruit consists of a group of drupelets. Each drupelet is an individual fruit and contains its own seed. Blackberry plants are appreciated by animals as well as humans. Birds, bears, coyotes, foxes, and squirrels feed on the berries. Bees use the nectar in the flowers to make a honey that is sold commercially. The green berries turn red and then black in late summer and early fall. Blackberries are worth picking. Like other berries, they are rich in nutrients. They could be bought in stores, but wild blackberries can be picked for free. Another advantage of eating wild blackberries is that picking the berries just before eating them ensures that they will contain the maximum concentration of nutrients. The raw berries are an excellent source of vitamins C and K and a good source of vitamin E. They also provide us with a variety of B vitamins, including folate. In addition, they contain beta-carotene, which our bodies convert into vitamin A.
Blackberries are rich in manganese and copper and provide a useful amount of magnesium, potassium, and other minerals. They also contain an interesting array of phytochemicals, or phytonutrients. These are chemicals which aren't essential for keeping us alive but are thought to help prevent disease. 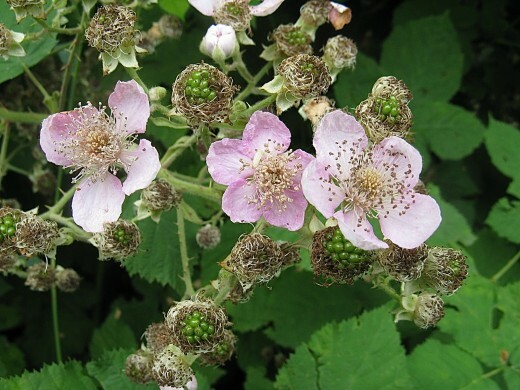 An individual Himalayan blackberry plant lives for only two or three years. Young plants grow over the dead canes, producing a tangled thicket than can be hard to remove. 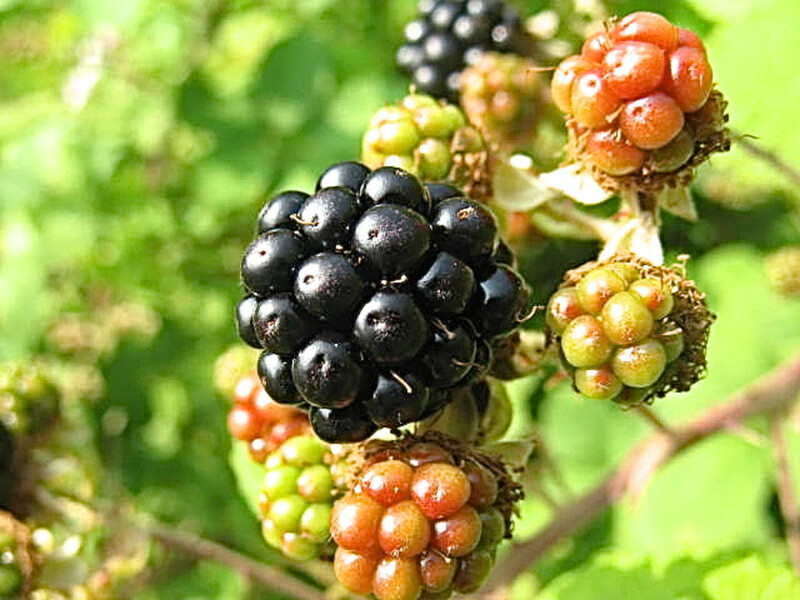 The Himalayan blackberry is considered to be native to Armenia and is sometimes called the Armenian blackberry. It was deliberately introduced to Europe in 1835 and to North America in 1885 for its fruit. It soon "escaped" into the wild via its seeds, which are eaten by birds and pass through their digestive systems unharmed. The plant has become invasive, growing and spreading rapidly. 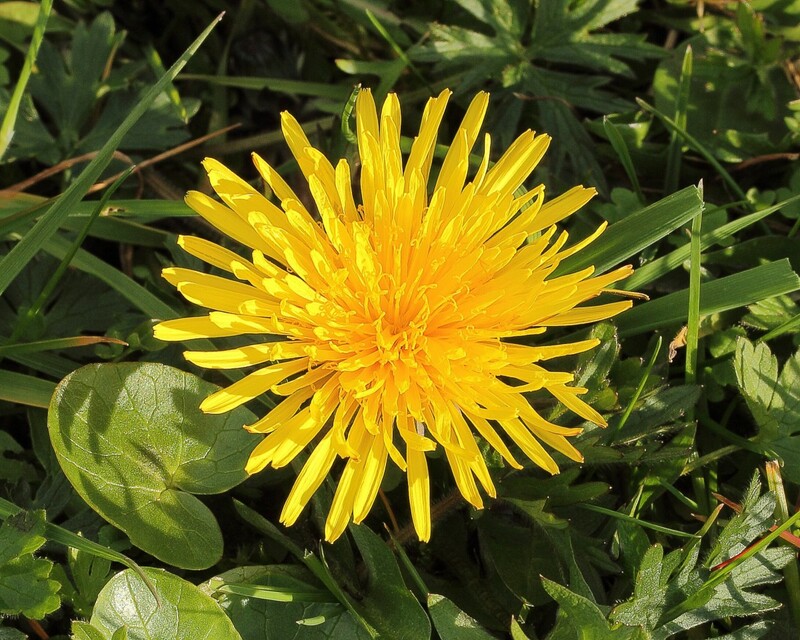 It's considered to be a noxious weed because it harms the environment. The Himalayan blackberry may change the local ecosystem. 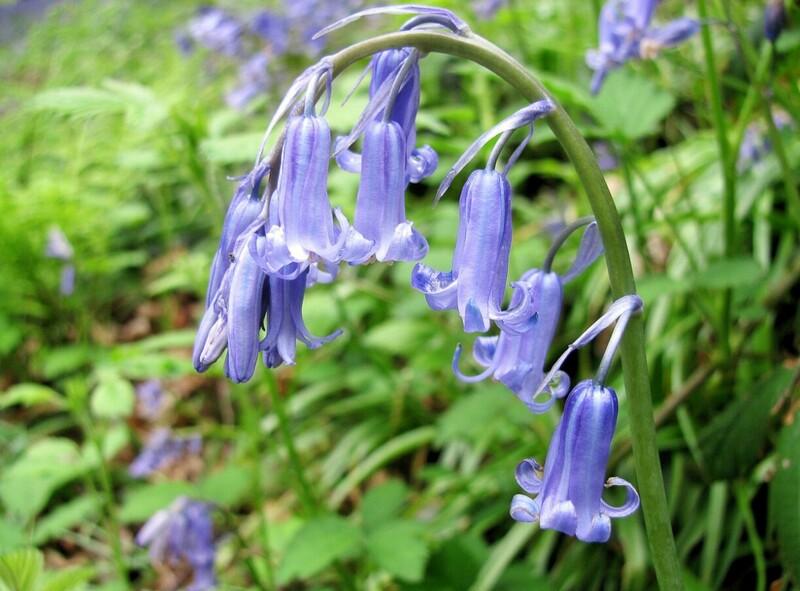 It forms dense thickets which crowd out many native plants and prevent shade-intolerant plants from growing. 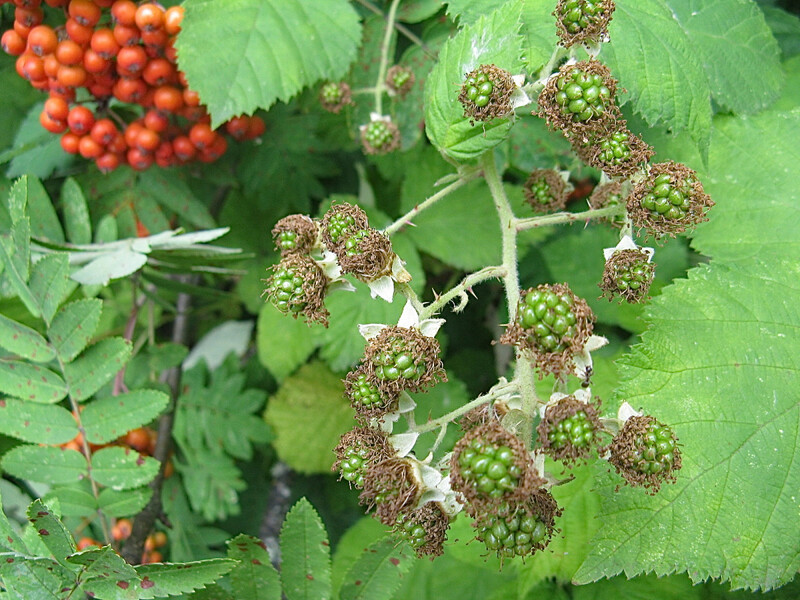 The growth of the blackberry bushes can reduce the available land area for farming. The bushes may prevent plants with deep roots from growing in their normal habitat along riverbanks, resulting in erosion of the banks. Dead blackberry leaves change the composition of the leaf litter. The prickly thickets prevent some animals from inhabiting the area and block their path to important places, such as water sources. 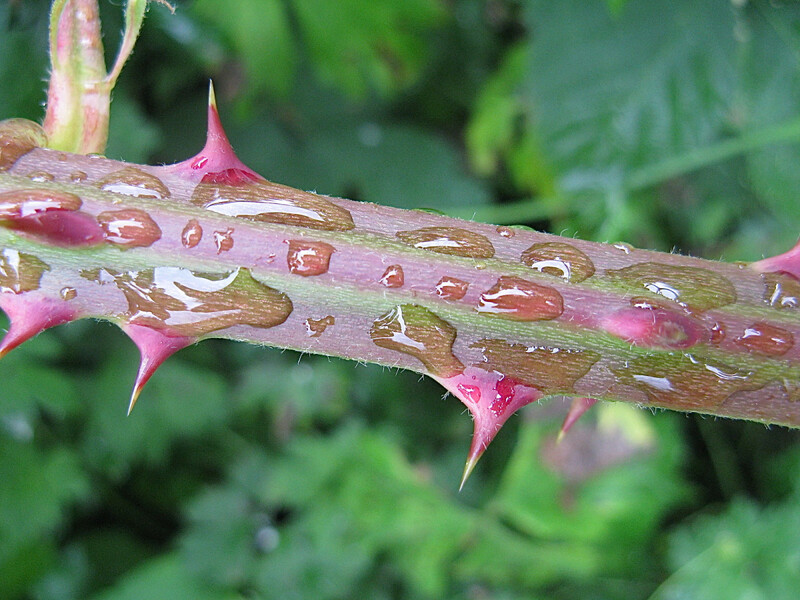 Animals may be trapped or injured by large thorns on the canes. On the other hand, some animals can travel through the thickets, including rats and feral domestic rabbits. The longer that Himalayan blackberry plants are left in an area, the harder they are to remove. It's much easier to remove young plants than mature ones. 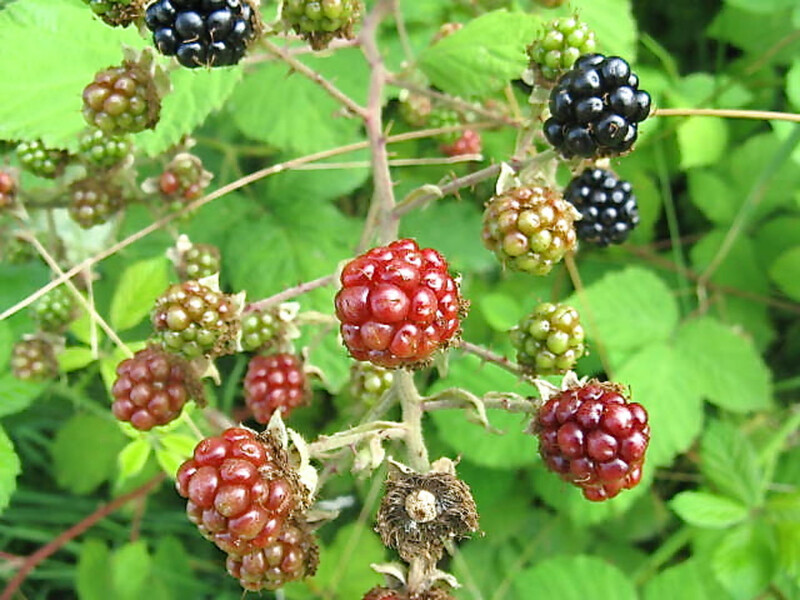 Some herbicides can help to destroy the plants, but these mustn't be used in areas where people collect blackberries. Another problem is that herbicides may be harmful for the environment. It's easy to monitor frequently visited areas like gardens and landscaped areas to check for the first appearance of a blackberry plant. In unmonitored areas, though, when blackberries are discovered they may have already formed a dense and impenetrable thicket. This situation requires determination and daily effort in order to remove the plants, but it can be done, as I know from experience. A strong lopper that can cut through thick stems is an essential tool. Once the visible parts of the plants are removed, the roots must be dug out in order to have the best chance of a permanent solution. This can be backbreaking work if it's done by hand and the roots are large. When the land is cleared, it's important to watch for a resurgence from seeds or bits of roots and stems. A minor regrowth can be dealt with quickly. It would be sad to let a plant gain the upper hand again after all the hard work done to remove it. Humans seem to have an ambivalent attitude towards Himalayan blackberries. Some people would hate the plants to disappear because they love the berries or the honey made from the berries. Other people hate the aggressive growth of the plant and the fact that it interferes with native plants and animals. Some people, like me, appreciate both sides of the debate. It's sad to see a wild area or a garden choked by blackberry plants, but the fruit is delicious. 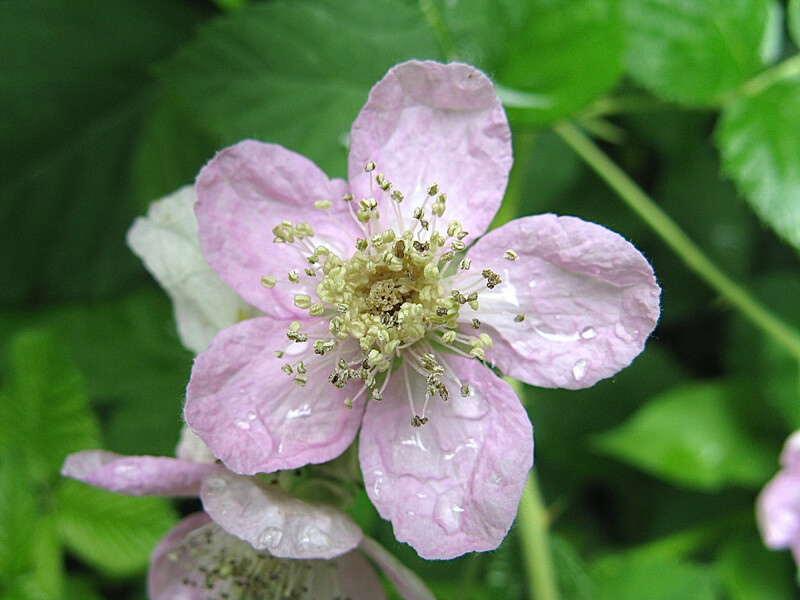 The Himalayan blackberry is widespread in southwestern British Columbia. 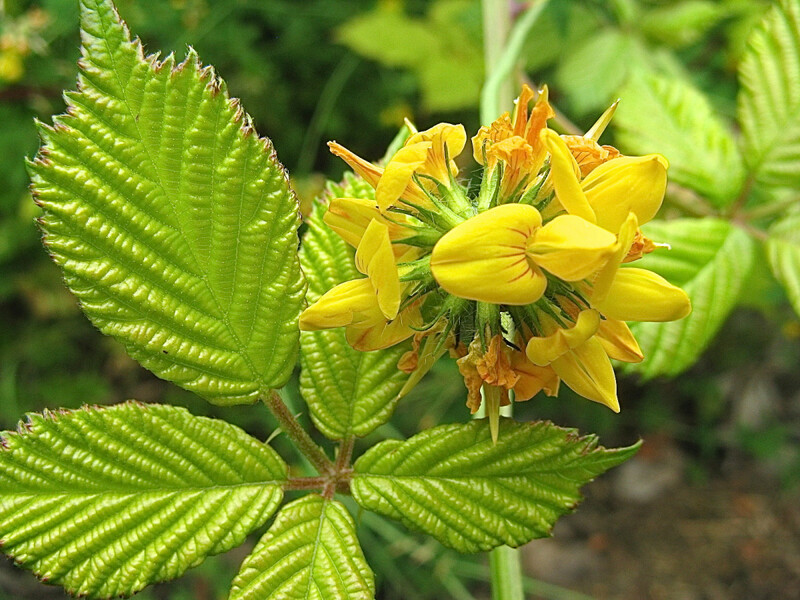 It has become such a common part of the landscape that many people are unaware that it's an introduced plant. I can’t help admiring the plant, not only for its delicious and bountiful fruit but also for the beauty of its fresh leaves, flowers, and berries. I have to admit that the dull green leaves of winter and the old, exposed canes are not attractive, however. Since the plant is common where I live and will likely remain so for the foreseeable future, I can continue to photograph its spring and summer beauty. Do the Himalayan blackberry bushes spread across refuge areas? Are the Himalayan blackberry root tubers edible? I collect Himalayan blackberry fruits to eat every year, but I’ve never considered eating any other part of the plant. In all my reading, I’ve never encountered any reference to someone eating the root (or the root tuber). Therefore I have to say no, the roots aren’t edible, simply because I don’t whether they are safe or dangerous. Many plants have one part that is edible and another part that is unsafe to eat. The edibility and deliciousness of Himalayan blackberry fruits doesn’t mean that the roots are safe. Plants or parts of plants shouldn’t be eaten unless there is definite evidence that they are safe. Hi. Where I live, the leaves stay green in winter. A few leaves become yellow, however, which means they are dead or dying. The plant doesn't flower in winter. I hope your plant does better in the spring. Hi, Peg. Yes, blackberry cobblers and pies are delicious! I'm picking blackberries every day right now where I live. There are already some that are ripe. Thank you so much for all the comments and for liking my Facebook page, Peg. This is informative and useful with beautiful photos. Blackberries are so wonderful to eat and so good for us. I loved reading about your habit of picking wild ones for harvest. I had no idea they were an invasive species. With their means of protection, thorns, it would make sense. I love to make them into blackberry cobbler. I consider blackberries a delicacy, too! I love picking them and eating them right away without even taking them home. It's such a shame that the plant is so invasive and is such a nuisance when it's growing where it's not wanted. Thanks for the visit. 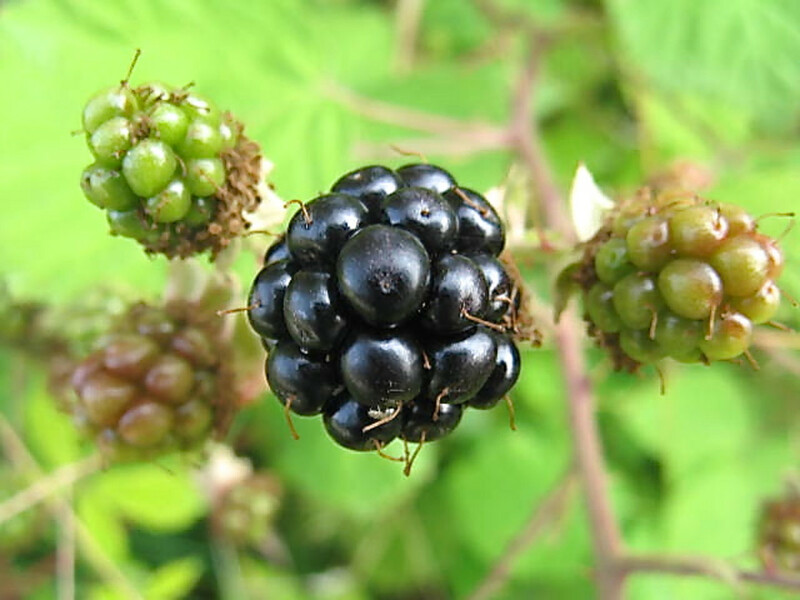 It is very difficult for those of us living in other parts of the country, who consider blackberries a delicacy, to even imagine these plants could ever be considered a nuisance. But I believe you. My pleasure AliciaC. I'll probably have the review online within the next week, so I hope it attracts one or two more visitors to this fine hub page. Alun. Thank you very much for the comment, Alun. I appreciate your visit and the request. Yes, it would be okay to use one of my photos in your hub. Thank you in advance for the mention! Excellent hub AliciaC with very fine photos to illustrate the blackberry plants. Particularly I admire the focusing on the picture of the thorny blackberry stem. 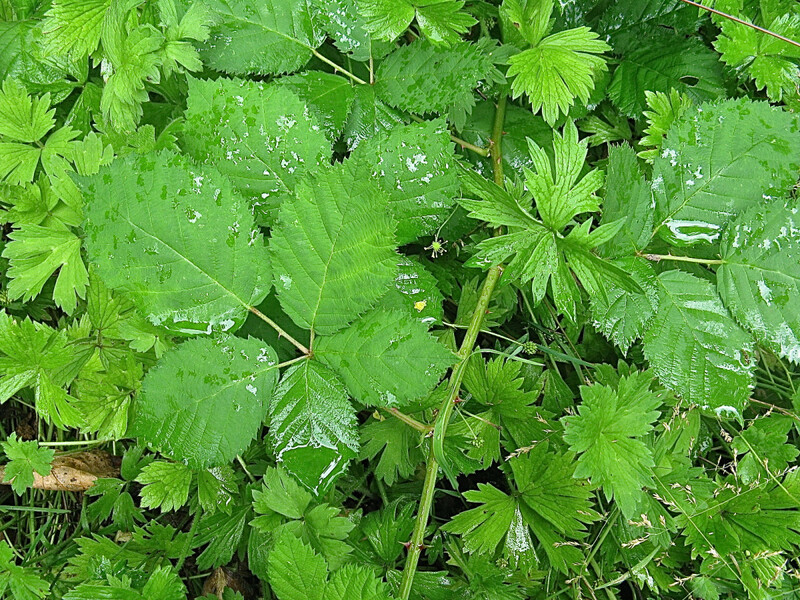 A very good study of the Himalayan blackberry - its good points and its bad (and very sharp!) points. Voted up. The hub will probably be published in about one week or so. Best wishes. Alun. Thanks for the comment, unknown spy. wow i love the photos.very beautiful! Hi, CMHypno. Thanks for the comment. Yes, it's very difficult to separate the benefits and the disadvantages of blackberries! The fruits are delicious, but blackberry thickets are hard to penetrate, and they cover other plants. I'm looking forward to picking the berries soon, though! I'm looking forward to picking ripe blackberries too, moonlake! We have a problem with wild blackberries trying to invade our garden, but not with wild raspberries. Thank you very much for the comment and vote. My husband is just waiting for our blackberries to get ripe. He loves to pick them. The blackberries here don't seem to get so wild. We have problems with wild raspberries getting into everything. Beautiful picture and interesting hub enjoyed reading it. Voted up. Thank you very much for the lovely comment, Prasetio! I appreciate all your votes. Have a great weekend! Alicia, you always do the best in every of your hubs, including this one. I had never heard about Himalayan Blackberry plants. Thanks for share with us. I learn something new here. Voted up and pressing all buttons, except funny. Thank you for the comment and the interesting information, Beelady. It's very nice to meet you! It would seem that plants that have evolved to live in the harsh environment of the Himalayas have too much of an easy time in more forgiving environments. 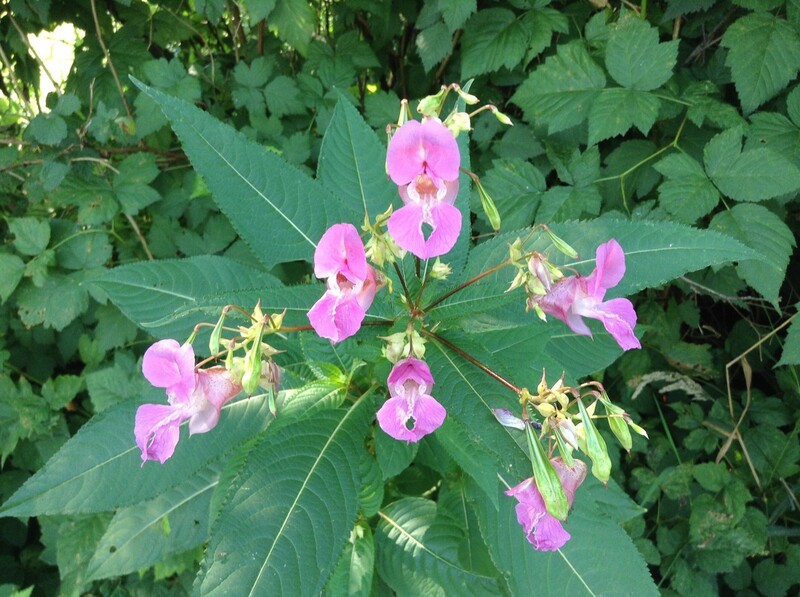 Our canal is currently overrun with the invasive Himlayan balsam - though bees love it! Thanks for a superbly informative hub. Thank you very much for the comment, teaches. I find nature and the study of living things endlessly fascinating! I love to observe nature and learn more about it. I don't know how you find these interesting topics but I am always fascinated by the details. Great job on covering this plant. Thank you, drbj. My mother and my aunt were both keen bakers, and they gave me my memories of wonderful cakes and pies. It's never quite the same when I make my own versions. 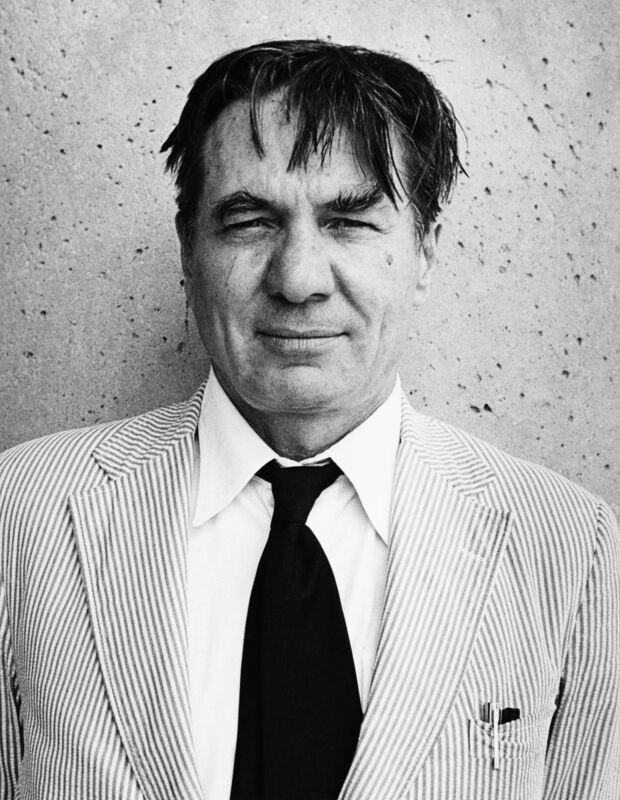 Thank you, Tom. Although the rapid growth of blackberry plants can be a problem, I enjoy studying them and photographing them. If they can be kept in one particular area without spreading they're a useful plant. Hi, theragged edge. Yes, that's the problem with blackberry plants. If they're not controlled they can quickly grow over over other things and take over the land. Their berries are so nice, though! I'm looking forward to making blackberry pies next month, and fruit crumbles sound like a very nice idea too! Thanks for the comment and the vote. Hi my friend, great and well written hub with all good information on the Himalayan Blackberry Plants, loved all the very beautiful photos in this hub, well done ! Very difficult to get rid of. We have a small paddock behind our house - not our land. When we moved in 10 years ago it was mostly grass. Now it is just a great heap of brambles - I think there is even a car in there somewhere! Used to pick a lot of blackberries and make blackberry jelly, blackberry and apple pie, and fruit crumbles. Maybe I should again - it's almost blackberry season here. Thanks, Joyce. I appreciate the comment and the vote. I've picked wild blackberries since childhood. It's a lovely summer tradition! I grew up with wild blackberries in England. We would just pick them their branch's and have a delicious snack. Great hub and tons of interesting information . Thank you so much for the kind comment, Martie! I appreciate your visit very much. Alicia, this is a very interesting and well-presented hub about the Himalayan Blackberry plants. 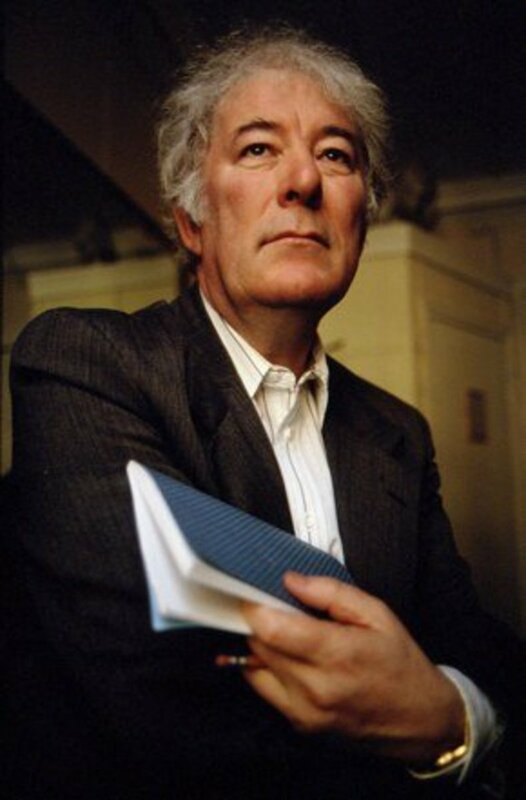 The quality of the pictures, too, is perfect. Thank you very much for the comment, Bill! Great info and loved the pics!